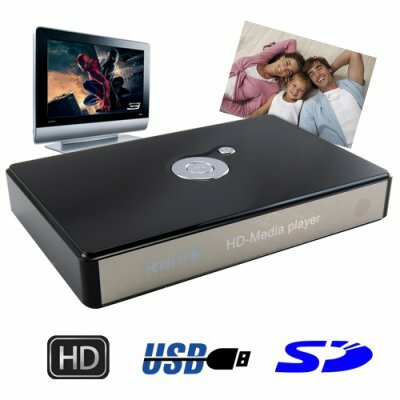 Successfully Added Memory Card and Flash Drive Media Player for TV to your Shopping Cart. This is our newest multi-format memory card (SD/MMC/USB/More) digital media player for home TV's. Coming with composite and component connections, the CVHV-E43 lets you watch high definition (720P) and standard definition movies and videos shows straight from SD cards and USB flash drives on your television. So what can you do with a memory card media player for your home TV? We all know how convenient it is these days to download videos from the internet or simply rip movies from your personal DVD collection to AVI files for easier storage and portability. But once you have these digital media files, how do you enjoy them on your big screen TV ? Well, with this next generation Memory Card and Flash Drive Media Player all you have to do is copy the file(s) you want to watch to a flash memory card and you can start enjoying them on your TV instantly! The CVHV-E43 is in stock right now for single piece and bulk purchases and is proudly brought to you from the leader in factory direct wholesale electronics, Chinavasion. Insert your SD card and USB key, and play hundreds of audio and video files, including VOB files. Does an HDD have to be installed in to the CVHV-E43? No, the CVHV-E43 comes with a USB slot and a SD card slot for simple and effective viewing of your digital content on your TV. With compatibility to use other media electronic devices as well. Does the CVHV-E43 also come with YPbPr cables to connect to my Subwoofer? Yes it does, enjoy listening to your favorite music in surround sound. Super fast delivery. The best media player ever. No more burning DVDs or CDs. Just transfer media from PC to flash drive or SD card and watch and listen on TV. Unfortunately power point wrong for Australia but everything else is more than what they clain it to be. Many thanks.